Steaming the corn: Bring a pot of water to a boil. Add the steamer insert and place all the corn ears in the steamer and steam for about 8-10 minutes. This step is to ensure that the corn is perfectly cooked. The corn will finish cooking on the grill. Grilling the corn: Brush the corn with a little olive oil, using a silicon brush. Place the corn on a griddle. Cook until you get grill marks (about 2 minutes on each side) over medium heat. As soon as the corn is grilled, season with salt and pepper. Remove from the pan. Cut the corn kernels off the cob, using a sharp chef's knife. Set aside. Pickling the red onion: Place the chopped onion in a bowl. Sprinkle with granulated sugar. Drizzle with lime juice. Toss well. Macerate for at least an hour. Set aside. Making ginger paste: Clean the ginger, carefully removing any dirt. Peel the ginger root with a paring knife, then finely chop the root. Place the chopped ginger in a mini-blender, add about 2 tablespoons (or more) of water for a smooth flow. Set aside. Assembling the ginger and cilantro sweet: In a non-stick pan, heat the remaining olive oil over high heat. The oil should be sizzling hot, near the smoking point. Add the minced garlic and let the garlic get slightly golden (don't burn it). Add the green onions. Coat them in oil and cook until they are translucent. Transfer to a bowl. Set aside. In the same pan, add ginger paste. Stir for about a minute. Add the corn kernels. Keep your stove at the highest temperature. Drizzle the soy sauce and add about 3/4 cup of water. Cook for about 3-4 minutes. Stir constantly. Add the plum sauce, brown sugar, pickled red onion, 1/4 cup coriander, green onions and chopped jalapeño. Turn off the heat. Let it stand for about 5 minutes. Garnish the corn with extra chopped cilantro and drizzle a little lime juice and toasted sesame oil. Little reminder on how to roast jalapeño peppers: it's the same method as roasting bell peppers. Once you know how to make them yourself, you'll never buy the ones in a jar again. To start, cut the stem off the jalapeño. Wash it, pat it dry, then brush it with oil. Place a grill on your stove, then char all the skin of the jalapeño. Wrap in aluminum foil. Let cool for about 5-10 minutes. Clean the chile using a knife; the skin will come right off. Seed it, then finely chop the flesh. Voilà! If you're having a barbeque, you can grill the corn directly without steaming. How to cut the corn kernels off the cob: Just stand the corn ear on end and slice the kernels down with a sawing motion. Each cob yields about 3/4 cup of corn. Published By: Jacqueline Pham on July 17, 2009. That looks great! I love the look of your web site! Oh yum. I love anything corn this time of year. This looks scrumptious! What a creative name for your blog! I love it and your wonderful photos! I'm so glad I found this blog! All the food on here looks awesome! Thanks for visiting my blog as well! Oh yes, I can see how this would be delicious. You've got quite the harmony of flavours there! I love ginger with sweet backdrops, like the corn in this salad. that looks fantastic, thanks for the recipe! 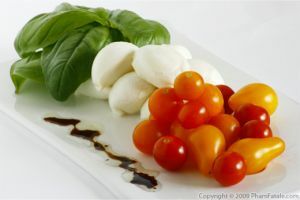 I am so loving this salad - looks like the perfect thing to go with all the Sunday afternoon grilling. Where does the brown sugar go in? Thanks for asking. 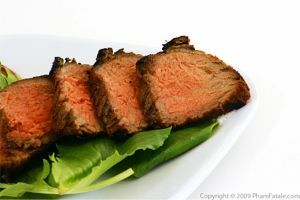 The brown sugar is added at the same time as the plum sauce to balance the flavor with the saltiness of the soy sauce. You can omit the brown sugar if the corn is naturally very sweet. Hope this helps! Oh good, that's what I'd guessed. We just made this to go with a flank steak, and it turned out great! Thanks! Corn season is just getting started here in Minnesota (our growing season is a bit behind the rest of the country) so I will be enjoying this salad for a few months yet - I hope! The flavors sound amazing together. 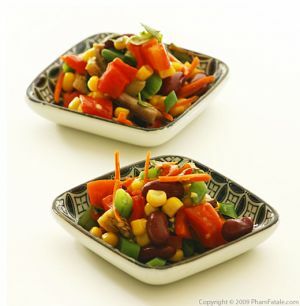 The Asian flavours in this corn salad sound so good! wow !! i am going to try this ginger corn this weekend. I love all your recipes. your pictures and your detailed preparation methods are great. Thanks for sharing.